On Saturday, our Red Cross volunteers got busy getting ready and training for our spring "Sound The Alarm, Save a Life" campaign. Over the last 7 days, the Greater New York Red Cross provided emergency assistance to 93 adults and 42 children following 46 local disasters. Here are some highlights from last week and a preview of upcoming activities (see below). As seen on Bronx News 12, residents across the Bronx got a lesson in preparedness during Bronx Preparedness Weekend. The Red Cross teamed up with the FDNY and the New York City Emergency Management Department to help share lifesaving tips on how to prevent fires and other emergencies. Shining the spotlight on one of our many rock star volunteers: meet Zoe Anderson! Zoe oversees all of the logistical activities for all five boroughs in New York City, and took some time to share her experience with us. With our spring campaign to #EndHomeFires coming up, on Saturday we hosted training events to help volunteers get ready to Sound the Alarm. We also had volunteers, this past Friday, out and about in Coney Island helping to recruit volunteers for smoke alarm installations. Many people have hopped on board to join us in our mission to help #EndHomeFires and install free smoke alarms. Last week we featured a few of these partners: Westchester County Executive George Latimer, Congresswoman Yvette D. Clarke, Congressman Hakeem Jeffries, Brooklyn Borough President Eric Adams, and Bronx Borough President Ruben Diaz Jr.
On Thursday, the Red Cross partnered with LIU to host “Building a Resilient Long Island: Preparedness and Partnerships” where we discussed preparing our communities for emergencies. On Tuesday, we announced one of the honorees for this year’s Red and White Ball – Major Mary Jennings Hegar who will be receiving the Exceptional Service Award. Hegar served three tours in Afghanistan and wrote the bestselling book, Shoot Like a Girl. 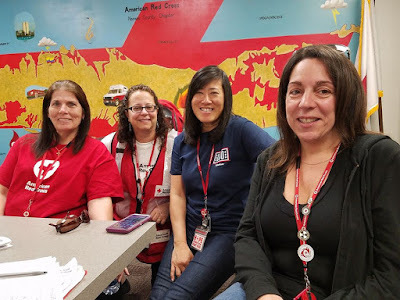 On Monday we welcomed Christine Malafi, to the Board of Directions of the American Red Cross Long Island. Congratulations Christine! Red Cross responders were on the scene of a fire in White Plains early Saturday morning to provide comfort and care for 70 evacuated residents. Responders also helped displaced residents after a home fire in Thornwood on Monday. Last week, Long Island Press honoredthe region’s most influential business, nonprofit and political leaders. Among their “Power List” members was our LI red Cross CEO, Neela Lockel. April 16, 20, 23: Red Cross blood drives will take place from 2 to 7 p.m. at the Greater NY Red Cross building located at 520 West 49th Street, Manhattan. Schedule an appointment to donate today. April 19-22: The Red Cross is holding their third annual Disaster Ready Summit, a multiple day training event for anyone who wants to learn how to help the American Red Cross respond to disasters in their community. Sign up here. April 27: Prior to the Red and White Ball, we will be holding a panel discussion with hero honorees Taylor Winston and Shiva Ghaed who were both in attendance at the tragic Las Vegas mass shooting that occurred at the Route 91 Harvest Music Festival on October 1st. Both have been instrumental in the rescue and recovery of the concertgoers as they put their lives back together after the traumatic event. Stay tuned for more details. April 28: The Red and White Ball is the primary source for funding for the American Red Cross New York. The Ball will feature live and silent auctions; wine and food; and music and dancing. Please join us for this black tie event. May 17: The American Red Cross Young Patrons are hosting an “Evening Under the Stars,” a summer rooftop networking soiree. You can find out more and buy tickets here. April 28, May 6, 12: Major “Sound the Alarm” fire safety smoke alarm installation events are coming to the Bronx on April 28 and in Brooklyn on May 6 and 12 and we need your help to install free smoke alarms in at-risk neighborhoods and to educate families on preparing for fires. Sign up by calling 877-733-2767 or by visiting www.soundthealarm.org/nyc. May 1: The Red Cross is holding a panel discussion between experts in humanitarian and global affairs about the many “silent” disasters that occur and the humanitarian implications of their lack of visibility. RSVP for the free panel here. Faithful and brave people. God bless you all.